How can I extend the battery life when using my Fairphone? In our age of constant connectivity, you’ll hear this question every day in offices, hotels and cafés worldwide. Our reliance on our phones has created a brand new kind of panic that ensues as soon as our battery charge drops down to 10 percent. If any of that sounds familiar, then this is the blog post for you! Below you’ll find a collection of proven tips we gathered from our in-house experts (aka the support team) to help you get more out of each battery charge. While we compiled these tips with Fairphone owners in mind, plenty are useful no matter what kind of smartphone you have. 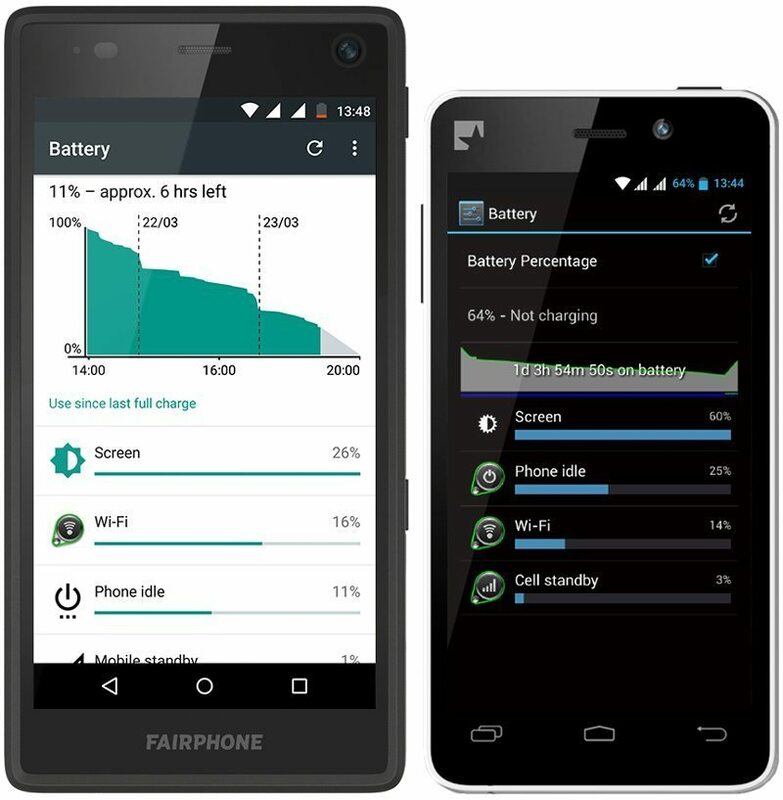 Let’s get straight to some tips on how to optimize the performance of your Fairphone battery. Every battery has a limited lifespan – it will only last for a certain number of charge cycles. And certain functionality, like the screen and data connections, will drain your battery in no time. So the key to ensuring that your battery performs well for as long as possible is to extend the amount of time between charges. Below you’ll find a selection of tactics we use to make the most of the Fairphone’s battery life. Note: We’ve created the animations/photos below using a Fairphone 2 and Fairphone 1 because the exact functionality can be slightly different. Using your screen requires a lot of energy, especially with a large, 5 inch screen. You can reduce the amount of energy required by adjusting the brightness. You can dim the brightness level of your screen by opening the pull-down menu. Slide the little sun icon to the left to dim your display (Fairphone 1: touch the sun icon to switch between different brightness settings). You can also access more advanced brightness and sleep settings under Settings > Display. 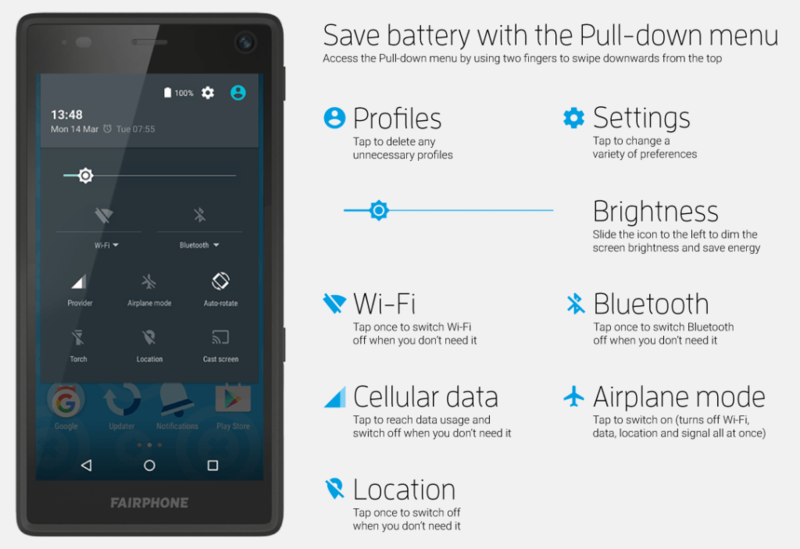 Here you can turn on Adaptive brightness (Fairphone 1: Automatic brightness), which automatically adjusts the brightness on your screen to the ambient light. You can also adjust how quickly your phone goes into sleep mode – to save energy, pick a lower time period like 30 seconds. Data connections are the second most significant energy consumers. If you’re using cellular data or Wi-Fi non-stop, you can drain a fully-charged battery in just a few hours. In general, it’s best to disable the connectivity functions that you don’t need. You can quickly enable or disable Wi-Fi or Bluetooth by opening the pull-down menu and tapping the related icon, or access this functionality through Settings. To toggle cellular data, you can either tap on the mobile connection symbol in the pull-down menu and use the Cellular data switch in the top right corner, or go to Settings > Data usage and set your preferences for each SIM card. Another way to reduce power consumption is to let the device decide which cellular network to use based on the signal strength, favoring whenever possible the most advanced and energy-efficient technology. To define your preferred cellular network type, go to Settings > More > Cellular networks (Fairphone 1: Mobile networks) and then select a SIM card. From here, pick 4G (preferred) (Fairphone 1: GSM/WCDMA (auto mode)) as the Preferred network type (Fairphone 1: the Network Mode in 3G service). Finally, if you can survive for awhile without any data or network connections, put your phone in Airplane mode – it’s the best way to conserve energy without completely turning off your phone. Just open the pull-down menu and tap on the airplane icon. Bonus connectivity tips: - If you have a weak mobile or Wi-Fi signal, your phone will consume more energy to stay connected. When this happens, try to move closer to the access point or turn off the data connection if you’re not using it. - If you spend lots of time online, you may want to install an ad blocker to reduce the amount of bandwidth and energy required to load a page. Location settings can also impact your battery usage, so whenever possible, we recommend switching to a less accurate, but more battery-friendly location setting. Note: Before you can make any changes, you need to enable Google Location Services and accept the license. If you haven’t done this yet, go to Settings > Location > Google Location History. To optimize your battery usage, go to Settings > Location > Mode and select Battery saving (Fairphone 1: turn the GPS satellites usage off in Settings > Location access). It’s important to realize that this mode reduces accuracy, so don’t use this if you need very specific location information, such as directions while you’re driving. If you don’t require any location services at all, open the pull-down menu (using two fingers) and disable location functionality by tapping on the related icon. You can learn more about location settings on this Google Help page. Wallpapers: Choose a static image instead of a dynamic one. To select a new wallpaper, touch and hold a blank space on your home screen, and then tap Wallpapers at the bottom left. Inactive apps: Uninstall the apps you don’t use. Go to All Apps, hold down the one you want to remove, and slide it to Uninstall at the top of the screen and release your finger. Accounts: You can remove the online accounts that you don’t use under Settings > Accounts. Locate the account you’d like to remove, and then use the settings menu (three vertical dots) to remove the account. Users (Fairphone 2 only): Remove unnecessary users by going to Settings > Users. Tap on the cogwheel next to the user profile that you’d like to remove and then tap on Remove user. Please note: the Guest account cannot be removed. Touch vibration (haptic feedback): Turn off touch vibration under Settings > Sound & notification > Other sounds and disable Vibrate on touch. Keyboard vibration: Go to Settings > Language & input > Android Keyboard > Preferences and turn off Vibrate on keypress. Your phone also has a built-in report to help you monitor your battery use. Go to Settings > Battery to see a graph of your battery level over time (tap it for more detail), plus what apps and functionality are using the most energy. Certain tasks, such as Android OS, Android System, and Google Services are core to the operating system, so they are essential parts and you cannot directly optimize their battery consumption. However, you can take a careful look at the third-party apps that are having the largest impact on your battery, and adjust the settings within the app itself. When you first start using your Fairphone, you may see drops in the battery report graph. Don’t be concerned – your battery needs to complete a few charging cycles before it’s properly calibrated. Have any more battery tips? In general, the best way to conserve your battery is to put down your phone and never use it again! However, we know that advice is very challenging to follow, so the above tips are a great starting point for understanding and improving your battery use.